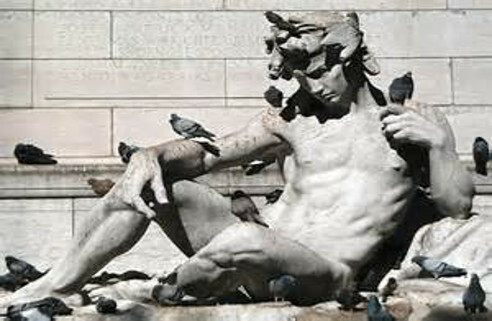 Pigeons are not native to the U.S. they were brought over by Europeans for messengers, homing and even as a food source. Pigeons are non-migratory meaning that they are often born, live and die in the same place. Once a building becomes home to pigeons, they are there for life. Pigeons are good flyers sometimes flying at speeds of up to 80 MPH. Pigeons normally live for 15 years and have been known to live up to 30 years. They produce 1 to 2 eggs at one time and may have several offspring each year. Eggs develop and hatch in about 17 to 19 days and the young are prepared to leave the nest in approximately 4 to 6 weeks. The adult female may lay another I to 2 eggs even before the young birds have left the nest. Pigeons can ruin the looks of your building as well as pose a health threat to employees and guests. Pigeon droppings contain uric acid that actually eats into the surface it drops on. Painted surfaces, canvas awnings, signs and other similar surfaces pose the most risk. Dried bird droppings can contain many fungal and viral diseases that can represent a serious liability to your company. Histoplasmosis, Encephalitis, Meningitis, St. Louis Encephalitis, and Salmonella are just a few of the common viral and bacterial diseases that have been associated with bird droppings. Fleas, Ticks, Mites, and Lice are just a few of the parasites that have been associated with Pigeons. Histoplasmosis is a common respiratory infection that is associated with Pigeon droppings. Histoplasmosis is caused by humans inhaling fungal spores that have cultivated on pigeon droppings. It has flu like symptoms that can persist for several weeks and that even some doctors can’t diagnose. Fleas, ticks and other parasites are also known to be spread by pigeons especially near water sources where they clean themselves and pick the parasites off and drop them on the ground or eat them. Pigeon ectoparasites such as mites, fleas, ticks, and bugs may readily bite people. Noisemaking devices including ultrasonic sound, revolving lights and rubber snakes usually have little or no effect for frightening pigeons from roosting areas. Olfactory repellents are ineffective in outdoor areas. Avitrol, a chemical frightening agent, is available as a whole corn bait for pigeon control. It is a Restricted Use Pesticide. Birds that consume sufficient amounts of the treated bait will die but they first display distress symptoms which frighten other members of the flock away but soon return. In urban areas, this chemical should be used cautiously because high mortality can cause adverse public reactions. Pigeon Man uses the most effective method of controlling Pigeons by reducing the numbers with capturing by live trapping. By removing the nests, and live trapping has been proven to be the best and humane way to control Pigeon populations.